pitsco.com/kubo ■ Retail Price: Single set—$279; 4-pack—$1,095. KUBO offers screen-free coding for K–2 students with a simple, intuitive, plug-and-learn robot for classrooms. The individual robots with blinking eyes are easily rechargeable. The product comes with TagTiles and quality online resources. Pitsco’s program motto is: “Coding made as simple as a puzzle.” KUBO works by running the robot over the TagTiles (which are easy to use and snap together) and reading the RFID microchips embedded in them to perform actions like turning right, going straight, reading functions, and executing loops. Quality and Effectiveness: Students and teachers alike will fall in love with this mini robot. KUBO’s five sections of quality STEM materials cover concepts including routes, functions, and loops. The primary-level activities, presented in puzzle format, increase in difficulty as students progress through them. Using the provided TagTiles, teachers can use lessons on the online portal (expanded curriculum was added in August for the 2018–2019 school year). 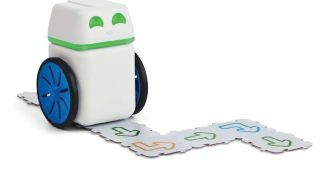 Depending on class needs and budgets, the robots and tiles can be purchased in single- or multi-packs for individual, small group, or whole class use. Ease of Use: The adorable two-piece robot, which beeps and changes color, is easy to assemble and can be used on tables or on the floor. Students can program KUBO to move around on the provided study mats. No screens or software are needed and an excellent website gives teachers online support and materials. Creative Use of Technology: This is a simple, straightforward program. Because teachers still need to know the program and the concepts, Pitsco makes that easy—providing everything from a quick-start guide to a simple cheat sheet, teachers’ manuals, well-crafted lesson plans with clear objectives, videos, and downloadable worksheets. All are immediately ready for teachers to use. As they use the materials, teachers can provide students with the support they need to discover the coding concepts with hands-on activities. Suitability for Use in School Environment: According to Pitsco, “Coding is best done in a hands-on, play-based environment,” and this stand-alone program is easy to integrate into the primary grades. The materials are easy to store and set up, as they come with their own labeled boxes and simple directions. Students are granted a KUBO coding license on completion of the lessons. KUBO is a great hands-on solution for teaching K–2 students about computer technology in general and coding in particular. Even teachers who have no coding background will find this easy to learn and use. • Provides an easy introduction to coding skills at an early elementary level. • The colorful robot is a simple but effective way to teach coding. • Excellent online materials can be downloaded as PDFs.